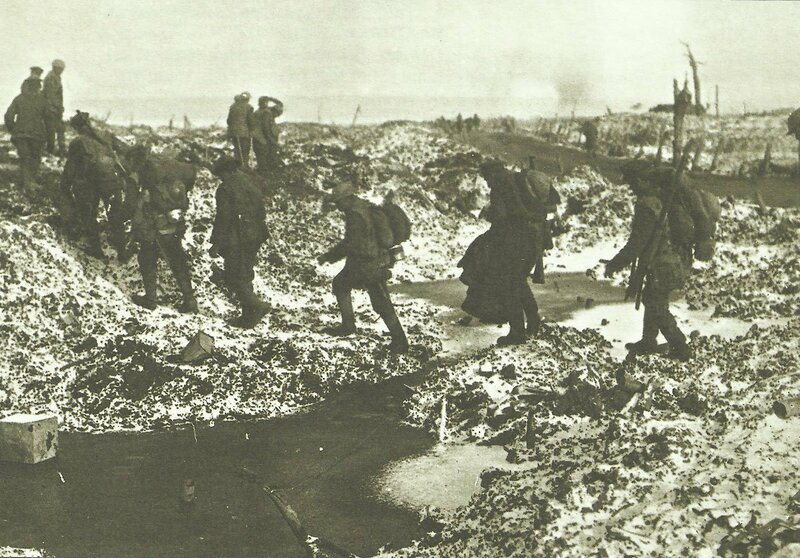 British troops negotiate the shell-cratered landscape along the Somme River in the first snow. Battle of the Somme: First snow falls, night November 17-18. Germany: French bomber pilot Captain Beauchamp in 1/2 Strutter ‘Ariel’ flies epic 812­-mile first ever ‘shuttle’ raid from Luxeuil (Vosges) – Munich (rail station bombed) – San Donadi Piave (near Venice). Beauchamp killed in action over Verdun in December. Western Front­: RFC ranges 141 targets, 16 aircraft in air combat (3 lost, 3 damaged), destroy 3 German planes in day and night bombing. Russia: Prime Minister Stuermer furious at pretended Russo-German peace talks. Belgium: Germans arrest Brussels Council.